At 2pm on November 6th Brian May will unveil an exhibition of stereoscopic 3D photographs that will allow visitors to the Gallery on the Green, Settle, to take a trip to the imaginary world of hell and the underworld. 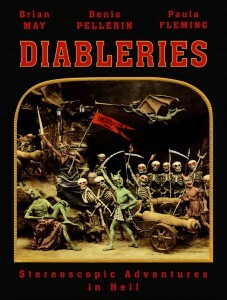 These photographs belong to a series created in France during the 1850s and known as the Diableries. These carefully crafted theatrical tableaux reveal a fantasy world of skeletons, devils, debauchery, that delight the eye and hold the attention of the viewer. For those who cannot make the opening there will be a stereoscopically illustrated lecture and book signing at the Victoria Hall, Settle at 7:30pm when the authors will reveal the mysteries and delights of these ghoulishly fantastical, photographs! !